This chinese fried rice recipe with chicken is better than takeout! You don’t need to order out anymore after tasting this dish! Chinese Fried Rice…something I’ve been wanting to make well for a long time now. Mr. Wishes and I are big fried rice fans. It’s one of our favorite things to eat anytime we are dining at an Asian restaurant. I don’t even care so much about any of the other food…as long as the fried rice is good then I’m happy! We don’t eat at Chinese food restaurants often nor do we order Chinese take-out on a regular basis, so it was absolutely necessary for me to make a “just as good as take-out” fried rice recipe so that I can enjoy it anytime, anyday! This came out perfect – not too greasy, not too salty, and full of flavor. I know that people have different views on what traditional or authentic Chinese fried rice is and should be, but this is my own take on it and the way I prefer it. You can adapt it to your liking! This was so easy to make, very enjoyable, tasty, and there was not a scrap left! I recommend it to anyone craving some good Chinese fried rice. It’s also a great way to use up leftover rice and/or chicken! Heat 2 tbsp oil in wok OR deep skillet; add chopped onions and stir-fry until onions turn a nice brown color, about 8-10 minutes; add in garlic and saute with onions for a couple of minutes (until fragrant). Allow wok/skillet to cool slightly. Add 1 tbsp oil to wok, swirling to coat surfaces; add egg mixture; swirl egg until egg sets against wok/skillet; when egg is set, flip egg and cook other side briefly; remove from wok/skillet, and chop into small pieces. Heat 2 tbsp oil in wok/skillet; add chicken to wok/skillet, along with carrots, peas, and cooked onion and garlic; stir-fry for 2 minutes. Add rice and green onions tossing to mix well; stir-fry for 3 minutes. Add 4-5 tbsp of soy sauce (add more or less to your liking, just make sure all rice is coated) and then add chopped egg to rice mixture and fold in; stir-fry for 1 minute more; serve hot. Serve with additional soy sauce on the side. Ah fried rice, a staple in my meal rotation. Love cooking extra rice and then using that 1 or 2 day old rice to make fried rice! Another trick I learned is if you have to make it fresh to use that night put it into the freezer until you are ready to use it. Helps to dry it out so that the consistency is right in the fried rice. No one wants mushy rice!!! Fried rice is a favorite in our house, whether it’s take out or at home! This looks so yummy! Curry powder sounds like a great addition! I might try that next time! Fried rice is obviously in the meal rotation at our house. Sometimes we make extra rice for stir fries just so we can eat fried rice the next day! Looks great! I am so in love with fried rice… and THIS recipe. My boys could really care less what is in it, too. Just as long as it’s fried rice. Isn’t that funny?! We don’t go out to Chinese restaurants… period. We just love it here at home. Going to have to make this one up…you’ve just seriously inspired me to make this for the boys’ lunch today. Thank you!! I’m glad I inspired you!! Enjoy! This looks awesome! I love fried rice but rarely make it myself because, well, I’m lazy like that. =P Yours looks like it turned out so amazing. YUM! I have always wanted to make fried rice at home! 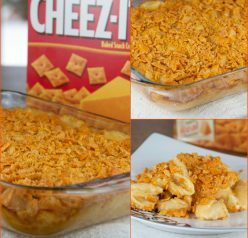 This looks delicious and the recipe sounds so easy to make! Thanks!! Thanks! I hope you like it Cindy!! Fried rice is such good stuff! And there are so many different ways to flavor it (and make it, really). This is wonderful — thanks. 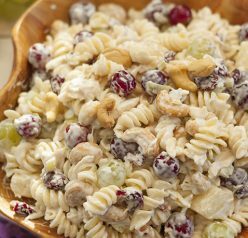 I love how versatile it is- you can really add any veggies! I love fried rice, Ashley! Your take is just the way I like it. 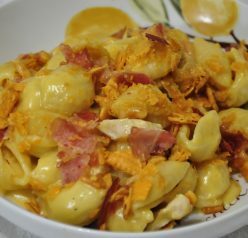 I might seriously have to make this with the leftover chicken from last night’s dinner. I have been wanting to order Chinese food for weeks, but I’m trying to hold out until after the baby arrives and I REALLY don’t feel like cooking. 😉 This could tide me over until then! 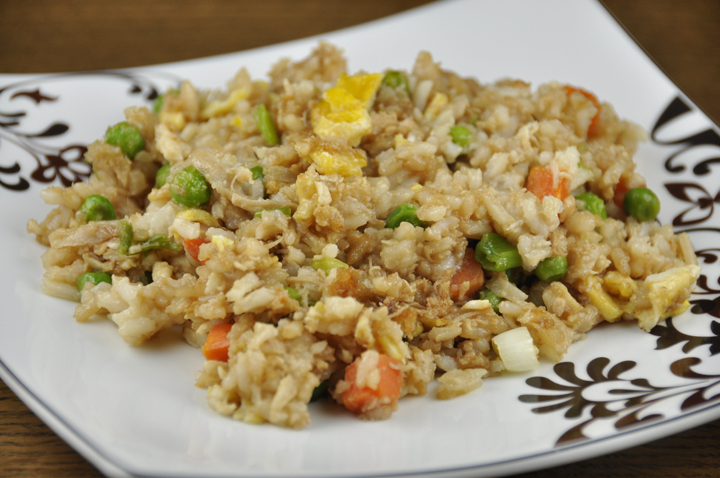 Love this fried rice it looks so yummy and has a great versatility too. I love fried rice! I feel like it’s such a good clean out the fridge meal too! This version looks so good!! I have always wanted to make fried rice at home too. I also really want to try fried quinoa. I’m a quinoa freak! You make this sound very easy, so I can’t wait to try it! I can’t believe I’ve never made fried rice before! I will definitely try this when I have leftover rice to use. Love flavored rice – simple to make and so delicious. Just perfect comfort food! This looks delicious! I love making fried rice! …and Chinese food in general. Thanks for sharing! I love Fried Rice and I’ve never made it – so thanks for the recipe! I’m always looking for a good fried rice recipe. I’m afraid the secret to great restaurant rice is tons of oil, so I’m always on the lookout for authentic recipes that are a bit lighter. I’m excited to give this one a try! I’ve been wanting to try fried rice for a long time now too!! Yours turned out so well – it looks absolutely delicious!